Mediterranean tropical-like cyclones, often referred to as medicanes (a portmanteau of Mediterranean hurricanes) but sometimes also as Mediterranean cyclones or as Mediterranean hurricanes, are meteorological phenomena observed over the Mediterranean Sea. On a few rare occasions, some storms have been observed reaching the strength of a Category 1 hurricane. The main societal hazard posed by Medicanes is not usually from destructive winds, but through life-threatening torrential rains and flash floods. The occurrence of Medicanes has been described as not particularly rare. Tropical-like systems were first identified in the Mediterranean basin in the 1980s, when widespread satellite coverage showing tropical-looking low pressures which formed a cyclonic eye in the center were identified. Due to the dry nature of the Mediterranean region, the formation of tropical, subtropical cyclones and tropical-like cyclones is infrequent and also hard to detect, in particular with the reanalysis of past data. Depending on the search algorithms used, different long term surveys of satellite era and pre-satellite era data came up with 67 tropical-like cyclones of tropical storm intensity or higher between 1947–2014, and around 100 recorded tropical-like storms between 1947 and 2011. More consensus exists about the long term temporal and spatial distribution of tropical-like cyclones: they form predominantly over the western and central Mediterranean Sea while the area east of Crete is almost devoid of tropical-like cyclones. The development of tropical-like cyclones can occur year round, with activity historically peaking between the months of September and January, while the count for the summer months of June and July is the lowest. Historically, the term tropical-like cyclone was coined in the 1980s to unofficially distinguish tropical cyclones developing outside the tropics (like in the Mediterranean Basin) from those developing inside the tropics. The term tropical-like was in no way meant to indicate a hybrid cyclone exhibiting characteristics not usually seen in "true" tropical cyclones. In their matured stages, Mediterranean tropical cyclones show no difference to other tropical cyclones. And only tropical cyclones are known to develop into hurricanes. Mediterranean hurricanes or medicanes are therefore not different from hurricanes elsewhere. Mediterranean tropical cyclones are not considered to be formally classified tropical cyclones and their region of formation is not officially monitored by any agency with meteorological tasks. However, the NOAA subsidiary Satellite Analysis Branch released information related to a medicane in November 2011 while it was active, it ceased doing so on 16 December 2011. In 2015, the NOAA resumed services in the Mediterranean region, and by 2016, the NOAA was issuing advisories on a new tropical system, Tropical Storm 90M. Additionally, beginning in October 2017, the newly-formed European Medicane Monitoring Center (EMMC) issues unofficial advisories on "Medicanes" in the region. ESTOFEX is issuing bulletins since 2005 that can include tropical-like cyclones, among others. No agency with meteorological tasks, however, is officially responsible for monitoring the formation and development of Medicanes as well as for their naming. The criteria applied in order to identify medicanes concern the detailed structure, the size and the lifetime of the systems using Meteosat satellite images in the infrared channel. They must have a continuous cloud cover and symmetric shape around a clearly visible cyclone eye. In the same article, a survey of 37 Medicanes revealed that Medicanes could have a well-defined cyclone eye at estimated maximum sustained winds between 47 kilometres per hour (29 mph) and 180 kilometres per hour (110 mph), with the lower end being exceptionally low for warm core cyclones. Medicanes can indeed develop well-defined eyes at such low maximum sustained winds of around 30 miles per hour (48 km/h) as could be seen for a 22 October 2015 Medicane near the Albanian coast. This is much lower than the lower threshold for eye development in tropical systems in the Atlantic Ocean which seems to be close to 50 miles per hour (80 km/h), well below hurricane-force winds. Several notable and damaging Medicanes are known to have occurred. In September 1969, a North African Mediterranean tropical cyclone produced flooding that killed nearly 600 individuals, left 250,000 homeless, and crippled local economies. A Medicane in September 1996 that developed in the Balearic Islands region spawned six tornadoes, and inundated parts of the islands. Several Medicanes have also been subject to extensive study, such as those of January 1982, January 1995, September 2006, November 2011, and November 2014. The January 1995 storm is one of the best-studied Mediterranean tropical cyclones, with its close resemblance to tropical cyclones elsewhere and availability of observations. The Medicane of September 2006, meanwhile, is well-studied, due to the availability of existing observations and data. Given the low profile of HNMS in forecasting and classifying tropical-like systems in the Mediterranean, a proper classification system for Mediterranean tropical-like cyclones does not exist. The HNMS criterion of a cyclonic eye for considering a system a Medicane is usually valid for a system at peak strength, often only hours before landfall, which is not suitable at least for forecasts and warnings. Another proposal uses roughly the same scale but suggests to use the term Medicane for tropical storm force cyclones and Major Medicane for hurricane force cyclones. Both proposals would fit the observation, that half of the 37 cyclones surveyed by HNMS with a clearly observable hurricane-like eye, as the major criterion for assigning the medicane status, showed maximum sustained winds between 76–110 kilometres per hour (41–59 kn), while another quarter of the medicanes peaked at lower wind speeds. A majority of Mediterranean tropical cyclones (tropical cyclogenesis) form over two separate regions. The first, more conducive for development than the other, encompasses an area of the western Mediterranean bordered by the Balearic Islands, southern France, and the shorelines of the islands of Corsica and Sardinia. The second identified region of development, in the Ionian Sea between Sicily and Greece and stretching south to Libya, is less favorable for tropical cyclogenesis. An additional two regions, in the Aegean and Adriatic seas, produce fewer medicanes, while activity is minimal in the Levantine region. The geographical distribution of Mediterranean tropical-like cyclones is markedly different than that of other cyclones, with the formation of regular cyclones centering on the Pyrenees and Atlas mountain ranges, the Gulf of Genoa, and the island of Cyprus in the Ionian Sea. Although meteorological factors are most advantageous in the Adriatic and Aegean seas, the closed nature of the region's geography, bordered by land, allows little time for further evolution. The geography of mountain ranges bordering the Mediterranean are conducive for severe weather and thunderstorms, with the sloped nature of mountainous regions permitting the development of convective activity. Although the geography of the Mediterranean region, as well as its dry air, typically prevent the formation of tropical cyclones, when certain meteorological circumstances arise, difficulties influenced by the region's geography are overcome. The occurrence of tropical cyclones in the Mediterranean Sea is generally extremely rare, with an average of 1.57 forming annually and merely 99 recorded occurrences of tropical-like storms discovered between 1948 and 2011 in a modern study, with no definitive trend in activity in that period. Few medicanes form during the summer season, though activity typically rises in autumn, peaks in January, and gradually decreases from February to May. In the western Mediterranean region of development, approximately 0.75 such systems form each year, compared to 0.32 in the Ionian Sea region. However, on very rare occasions, similar tropical-like storms may also develop in the Black Sea. Studies have evaluated that global warming can result in higher observed intensities of tropical cyclones as a result of deviations in the surface energy flux and atmospheric composition, which both heavily influence the development of medicanes as well. In tropical and subtropical areas, sea surface temperatures (SSTs) rose 0.2 °C (0.36 °F) within a 50-year period, and in the North Atlantic and Northwestern Pacific tropical cyclone basins, the potential destructiveness and energy of storms nearly doubled within the same duration, evidencing a clear correlation between global warming and tropical cyclone intensities. Within a similarly recent 20-year period, SSTs in the Mediterranean Sea increased by 0.6 to 1 °C (1.1 to 1.8 °F), though no observable increase in medicane activity has been noted, as of 2013[update]. In 2006, a computer-driven atmospheric model evaluated the future frequency of Mediterranean cyclones between 2071 and 2100, projecting a decrease in autumn, winter, and spring cyclonic activity coinciding with a dramatic increase in formation near Cyprus, with both scenarios attributed to elevated temperatures as a result of global warming. Other studies, however, have been inconclusive, forecasting both increases and decreases in duration, number, and intensity. Three independent studies, using different methodologies and data, evaluated that while medicane activity would likely decline with a rate depending on the climate scenario considered, a higher percentage of those that formed would be of greater strength. The development of tropical or subtropical cyclones in the Mediterranean Sea can usually only occur under somewhat unusual circumstances. Low wind shear and atmospheric instability induced by incursions of cold air are often required. A majority of Medicanes are also accompanied by upper-level troughs, providing energy required for intensifying atmospheric convection—thunderstorms—and heavy precipitation. The baroclinic properties of the Mediterranean region, with high temperature gradients, also provides necessary instability for the formation of tropical cyclones. Another factor, rising cool air, provides necessary moisture as well. Warm sea surface temperatures (SSTs) are mostly unnecessary, however, as most Medicanes' energy are derived from warmer air temperatures. When these favorable circumstances coincide, the genesis of warm-core Mediterranean tropical cyclones, often from within existing cut-off cold-core lows, is possible in a conducive environment for formation. Factors required for the formation of Medicanes are somewhat different than that normally expected of tropical cyclones; known to emerge over regions with sea surface temperatures (SSTs) below 26 °C (79 °F), Mediterranean tropical cyclones often require incursions of colder air to induce atmospheric instability. A majority of Medicanes develop above regions of the Mediterranean with SSTs of 15 to 26 °C (59 to 79 °F), with the upper bound only found in the southernmost reaches of the sea. Despite the low sea surface temperatures, the instability incited by cold atmospheric air within a baroclinic zone—regions with high differences in temperature and pressure—permits the formation of Medicanes, in contrast to tropical areas lacking high baroclinity, where raised SSTs are needed. While significant deviations in air temperature have been noted around the time of Mediterranean tropical cyclones' formation, few anomalies in sea surface temperature coincide with their development, indicating that the formation of Medicanes is primarily controlled by higher air temperatures, not by anomalous SSTs. Similar to tropical cyclones, minimal wind shear—difference in wind speed and direction over a region—as well as abundant moisture and vorticity encourages the genesis of tropical cyclone-like systems in the Mediterranean Sea. Due to the confined character of the Mediterranean and the limited capability of heat fluxes—in the case of Medicanes, air—sea heat transfer—tropical cyclones with a diameter larger than 300 km (190 mi) cannot exist within the Mediterranean. Despite being a relatively baroclinic area with high temperature gradients, the primary energy source utilized by Mediterranean tropical cyclones is derived from underlying heat sources generated by the presence of convection—thunderstorm activity—in a humid environment, similar to tropical cyclones elsewhere outside the Mediterranean Sea. In comparison to other tropical cyclone basins, the Mediterranean Sea generally presents a difficult environment for development; although the potential energy necessary for development is not abnormally large, its atmosphere is characterized by its lack of moisture, impeding potential formation. The full development of a Medicane often necessitates the formation of a large-scale baroclinic disturbance, transitioning late in its life cycle into a tropical cyclone-like system, nearly always under the influence of a deep, cut-off, cold-core low within the middle-to-upper troposphere, frequently resulting from abnormalities in a wide-spreading Rossby wave—massive meanders of upper-atmospheric winds. The development of Medicanes often results from the vertical shift of air in the troposphere as well, resulting in a decrease in its temperature coinciding with an increase in relative humidity, creating an environment more conducive for tropical cyclone formation. This, in turn, leads to in an increase in potential energy, producing heat-induced air-sea instability. Moist air prevents the occurrence of convective downdrafts—the vertically downward movement of air—which often hinder the inception of tropical cyclones, and in such a scenario, wind shear remains minimal; overall, cold-core cut-off lows serve well for the later formation of compact surface flux-influenced warm-core lows such as Medicanes. The regular genesis of cold-core upper-level lows and the infrequency of Mediterranean tropical cyclones, however, indicate that additional unusual circumstances are involved the emergence of the latter. Elevated sea surface temperatures, contrasting with cold atmospheric air, encourage atmospheric instability, especially within the troposphere. In general, most Medicanes maintain a radius of 70 to 200 km (40 to 120 mi), last between 12 hours and 5 days, travel between 700 to 3,000 km (430 to 1,860 mi), develop an eye for less than 72 hours, and feature wind speeds of up to 144 km/h (89 mph); in addition, a majority are characterized on satellite imagery as asymmetric systems with a distinct round eye encircled by atmospheric convection. Weak rotation, similar to that in most tropical cyclones, is usually noted in a Medicane's early stages, increasing with intensity; Medicanes, however, often have less time to intensify, remaining weaker than most North Atlantic hurricanes and only persisting for the duration of a few days. The theoretical maximum potential intensity of Medicanes is equivalent to the lowest classification on the Saffir–Simpson hurricane wind scale, a Category 1 hurricane. While the entire lifetime of a cyclone may encompass several days, most will only retain tropical characteristics for less than 24 hours. Circumstances sometimes permit the formation of smaller-scale Medicanes, although the required conditions differ even from those needed by other Medicanes. The development of abnormally small tropical cyclones in the Mediterranean usually requires upper-level atmospheric cyclones inducing cyclogenesis in the lower atmosphere, leading to the formation of warm-core lows, encouraged by favorable moisture, heat, and other environmental circumstances. Mediterranean cyclones have been compared to polar lows—cyclonic storms which typically develop in the far regions of the Northern and Southern Hemispheres—for their similarly small size and heat-related instability; however, while Medicanes nearly always feature warm-core lows, polar lows are primarily cold-core. The prolonged life of Medicanes and similarity to polar lows is caused primarily by origins as synoptic-scale surface lows and heat-related instability. Heavy precipitation and convection within a developing Mediterranean tropical cyclone are usually incited by the approach of an upper-level trough—an elongated area of low air pressures—bringing downstream cold air, encircling an existing low-pressure system. After this occurs, however, a considerable reduction in rainfall rates occurs despite further organization, coinciding with a decrease in previously high lightning activity as well. Although troughs will often accompany Medicanes along their track, separation eventually occurs, usually in the later part of a Mediterranean tropical cyclone's life cycle. At the same time, moist air, saturated and cooled while rising into the atmosphere, then encounters the Medicane, permitting further development and evolution into a tropical cyclone. Many of these characteristics are also evident in polar lows, except for the warm core characteristic. There have been 100 recognized tropical-like cyclones in the Mediterranean Sea between 1947 and 2011 from the databases of the Laboratory of Climatology and Atmospheric Environment, University of Athens, and METEOSAT. By steady accrual of reported and recognized occurrences of tropical-like cyclones (Medicanes), the number count reached 82 by 30 September 2018. Unlike most northern hemisphere cyclone seasons, Mediterranean tropical-like cyclone activity peaks between the months of September and January. The numbers do not necessarily mean that all occurrences of Medicanes have been fetched in particular before the end of the 1980s. With the development (and constant improvement) of satellite-based observations, the number count of clearly identified Medicanes increased from the 1980s onward. There might be an additional impact from climate change in the frequency of the observed Medicanes, but this is not deducible from the data. An unusually severe Mediterranean tropical cyclone developed on 23 September 1969 southeast of Malta, producing severe flooding. Steep pressure and temperature gradients above the Atlas mountain range were evident on 19 September, a result of cool sea air attempting to penetrate inland; south of the mountains, a lee depression—a low-pressure area in a mountainous region—developed. Under the influence of mountainous terrain, the low initially meandered northeastward. Following the entry of cool sea air, however, it recurved to the southeast before transitioning into a Saharan depression associated with a distinct cold front by 22 September. Along the front's path, desert air moved northward while cold air drifted in the opposite direction, and in northern Libya, warm arid air clashed with the cooler levant of the Mediterranean. The organization of the disturbance improved slightly further before emerging into the Mediterranean Sea on 23 September, upon which the system experienced immediate cyclogenesis, rapidly intensifying while southeast of Malta as a cold-core cut-off low, and acquiring tropical characteristics. In western Africa, meanwhile, several disturbances converged toward Mauritania and Algeria, while the medicane recurved southwestward back toward the coast, losing its closed circulation and later dissipating. The cyclone produced severe flooding throughout regions of northern Africa. Malta received upward of 123 mm (4.8 in) of rainfall on 23 September, Sfax measured 45 mm (1.8 in) on 24 September, Tizi Ouzou collected 55 mm (2.2 in) on 25 September, Gafsa received 79 mm (3.1 in) and Istanbul measured 46 mm (1.8 in) on 26 September, Cap Bengut collected 43 mm (1.7 in) on 27 September, and Biskra received 122 mm (4.8 in) on 28 September. In Malta, a 20000-ton tanker struck a reef and split in two, while in Gafsa, Tunisia, the cyclone flooded phosphate mines, leaving over 25,000 miners unemployed and costing the government over £2 million per week. Thousands of camels and snakes, drowned by flood waters, were swept out to sea, and massive Roman bridges, which withstood all floods since the fall of the Roman Empire, collapsed. In all, the floods in Tunisia and Algeria killed almost 600 individuals, left 250,000 homeless, and severely damaged regional economies. Due to communication problems, however, flood relief funds and television appeals were not set up until nearly a month later. The unusual Mediterranean tropical storm of January 1982, dubbed Leucosia, was first detected in waters north of Libya. The storm likely reached the Atlas mountain range as a low-pressure area by 23 January 1982, reinforced by an elongated, slowly-drifting trough above the Iberian Peninsula. Eventually, a closed circulation center developed by 1310 UTC, over parts of the Mediterranean with sea surface temperatures (SSTs) of approximately 16 °C (61 °F) and air temperature of 12 °C (54 °F). A hook-shaped cloud developed within the system shortly thereafter, rotating as it elongated into a 150 km (93 mi)-long comma-shaped apparatus. After looping around Sicily, it drifted eastward between the island and Peloponnese, recurving on its track again, exhibiting clearly curved spiral banding before shrinking slightly. The cyclone reached its peak intensity at 1800 UTC on the following day, maintaining an atmospheric pressure of 992 mbar (29.30 inHg), and was succeeded by a period of gradual weakening, with the system's pressure eventually rising to 1009 mbar (29.80 inHg). The system slightly reintensified, however, for a six-hour period on 26 January. Ship reports indicated winds of 93 km/h (57.7 mph or 50.2 kt) were present in the cyclone at the time, tropical storm-force winds on the Saffir–Simpson hurricane wind scale, likely near the eyewall of the cyclone, which features the highest winds in a tropical cyclone. The Global Weather Center's Cyclone Weather Center of the United States Air Force (USAF) initiated "Mediterranean Cyclone Advisories" on the cyclone at six-hour intervals starting at 1800 UTC on 27 January, until 0600 UTC on the following day. Convection was most intense in the eastern sector of the cyclone as it drifted east-northeastward. On infrared satellite imagery, the eye itself was 58.5 km (36.4 mi) in diameter, contracting to just 28 kilometres (17 mi) one day prior to making landfall. The cyclone passed by Malta, Italy, and Greece before dissipating several days later in the extreme eastern Mediterranean. Observations related to the cyclone, however, were inadequate, and although the system maintained numerous tropical characteristics, it is possible it was merely a compact but powerful extratropical cyclone exhibiting a clear eye, spiral banding, towering cumulonimbi, and high surface winds along the eyewall. On 27 September 1983, a Medicane was observed at sea between Tunisia and Sicily, looping around Sardinia and Corsica, coming ashore twice on the islands, before making landfall at Tunis early on 2 October and dissipating. The development of the system was not encouraged by baroclinic instability; rather, convection was incited by abnormally high sea surface temperatures (SSTs) at the time of its formation. It also featured a definitive eye, tall cumulonimbus clouds, intense sustained winds, and a warm core. For most of its duration, it maintained a diameter of 200 to 300 km (120 to 190 mi), though it shrank just before landfall on Ajaccio to a diameter of 100 km (62 mi). Among numerous documented Medicanes, the cyclone of January 1995, which was dubbed Celeno, is generally considered to be the best-documented instance in the 20th century. Emerging off of the Libyan coast into the central Mediterranean Sea toward the Ionian shoreline of Greece on 13 January as a compact low-pressure area, the precursor low maintained winds reaching up to 108 km/h (67 mph) as it traversed the Ionian Sea, while the German research ship Meteor recorded winds of 135 km/h (84 mph). Upon the low's approach near Greece, it began to envelop an area of atmospheric convection; meanwhile, in the middle troposphere, a trough extended from Russia to the Mediterranean, bringing with it extremely cold temperatures. Two low-pressure areas were present along the path of the trough, with one situated above Ukraine and the other above the central Mediterranean, likely associated with a low-level cyclone over western Greece. Upon weakening and dissipation on 14 January, a second low, the system which would evolve into the Mediterranean tropical cyclone, developed in its place on 15 January. At the time of formation, high clouds indicated the presence of intense convection, and the cyclone featured an axisymmetric cloud structure, with a distinct, cloud-free eye and rainbands spiraling around the disturbance as a whole. Soon thereafter, the parent low separated from the medicane entirely and continued eastward, meandering toward the Aegean Sea and Turkey. Initially remaining stationary between Greece and Sicily with a minimum atmospheric pressure of 1002 mbar (29.59 inHg), the newly formed system began to drift southwest-to-south in the following days, influenced by northeasterly flow incited by the initial low, now far to the east, and a high-pressure area above central and eastern Europe. The system's atmospheric pressure increased throughout 15 January due to the fact it was embedded within a large-scale environment, with its rising pressure due to the general prevalence of higher air pressures throughout the region, and was not a sign of deintensification. Initial wind speeds within the young medicane were generally low, with sustained winds of merely 28 to 46 km/h (17 to 29 mph), with the highest recorded value associated with the disturbance being 63 km/h (39 mph) at 0000 UTC on 16 January, slightly below the threshold for tropical storm on the Saffir–Simpson hurricane wind scale. Its structure now consisted of a distinct eye encircled by counterclockwise-rotating cumulonimbi with cloud top temperatures colder than −50 °C (−58 °F), evidencing deep convection and a regular feature observed in most tropical cyclones. At 1200 UTC on 16 January, a ship recorded winds blowing east-southeast of about 50 knots (93 km/h) south-southwest about 50 km (31 mi) north-northeast of the cyclone's center. Intense convection continued to follow the entire path of the system as it traversed the Mediterranean, and the cyclone made landfall in northern Libya at approximately 1800 UTC on 17 January, rapidly weakening after coming ashore. As it moved inland, a minimum atmospheric pressure of 1012 mbar (29.89 inHg) was recorded, accompanied by wind speeds of 93 km/h (58 mph) as it slowed down after passing through the Gulf of Sidra. Although the system retained its strong convection for several more hours, the cyclone's cloud tops began to warm, evidencing lower clouds, before losing tropical characteristics entirely on 17 January. Offshore ship reports recorded that the medicane produced intense winds, copious rainfall, and abnormally warm temperatures. Three notable medicanes developed in 1996. The first, in mid-September 1996, was a typical Mediterranean tropical cyclone that developed in the Balearic Islands region. At the time of the cyclone's formation, a powerful Atlantic cold front and a warm front associated with a large-scale low, producing northeasterly winds over the Iberian peninsula, extended eastward into the Mediterranean, while abundant moisture gathered in the lower troposphere over the Balearic channel. On the morning of 12 September, a disturbance developed off of Valencia, Spain, dropping heavy rainfall on the coast even without coming ashore. An eye developed shortly thereafter as the system rapidly traversed across Majorca and Sardinia in its eastward trek. It made landfall upon the coast of southern Italy on the evening of 13 September with a minimum atmospheric pressure of 990 mbar (29.24 inHg), dissipating shortly after coming ashore, with a diameter of about 150 km (93 mi). At Valencia and other regions of eastern Spain, the storm generated heavy precipitation, while six tornadoes touched down over the Balearic Islands. While approaching the coast of the Balearic Islands, the warm-core low induced a pressure drop of 11 mbar (0.32 inHg) at Palma, Majorca in advance of the tropical cyclone's landfall. Medicanes as small as the one that formed in September 1996 are atypical, and often require circumstances different even from those required for regular Mediterranean tropical cyclone formation. Warm low-level advection–transfer of heat through air or sea–caused by a large-scale low over the western Mediterranean was a primary factor in the rise of strong convection. The presence of a mid- to upper-level cut-off cold-core low, a method of formation typical to medicanes, was also key to the development of intense thunderstorms within the cyclone. In addition, interaction between a northeastward-drifting trough, the medicane, and the large-scale also permitted the formation of tornadoes within thunderstorms generated by the cyclone after making landfall. 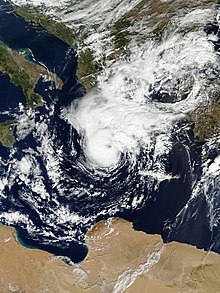 The second of the three recorded Mediterranean tropical cyclones in 1996 formed between Sicily and Tunisia on 4 October, making landfall on both Sicily and southern Italy. The Medicane generated major flooding in Sicily. In Calabria, wind gusts of up to 108 km/h (67 mph) were reported in addition to severe inundation. The third major Mediterranean tropical cyclone of that year formed north of Algeria, and strengthened while sweeping between the Balearic Islands and Sardinia, with an eye-like feature prominent on satellite. The storm was unofficially named Cornelia. The eye of the storm was distorted and disappeared after transiting over southern Sardinia throughout the evening of 8 October, with the system weakening as a whole. On the morning of October 9, a smaller eye emerged as the system passed over the Tyrrhenian Sea, gradually strengthening, with reports 100 km (62 mi) from the storm's center reporting winds of 90 km/h (56 mph). Extreme damage was reported in the Aeolian Islands after the tropical cyclone passed north of Sicily, though the system dissipated while turning southward over Calabria. Overall, the lowest estimated atmospheric pressure in the third medicane was 998 mbar (29.47 inHg). Both October systems featured distinctive spiral bands, intense convection, high sustained winds, and abundant precipitation. A short-lived medicane, named Querida by the Free University of Berlin, developed near the end of September 2006, along the coast of Italy. The origins of the medicane can be traced to the alpine Atlas mountain range on the evening of 25 September, likely forming as a normal lee cyclone. At 0600 UTC on 26 September, European Centre for Medium-Range Weather Forecasts (ECMWF) model analyses indicated the existence of two low-pressure areas along the shoreline of Italy, one on the west coast, sweeping eastward across the Tyrrhenian Sea, while the other, slightly more intense, low was located over the Ionian Sea. As the latter low approached the Strait of Sicily, it met an eastward-moving convection-producing cold front, resulting in significant intensification, while the system simultaneously reduced in size. It then achieved a minimum atmospheric pressure of approximately 986 mbar (29.12 inHg) after transiting north-northeastward across the 40 km (25 mi)-wide Salentine peninsula in the course of roughly 30 minutes at 0915 UTC the same day. Wind gusts surpassing 144 km/h (89 mph) were recorded as it passed over Salento due to a steep pressure gradient associated with it, confirmed by regional radar observations denoting the presence of a clear eye. The high winds inflicted moderate damages throughout the peninsula, though specific damage is unknown. Around 1000 UTC, both radar and satellite recorded the system's entry into the Adriatic Sea and its gradual northwestward curve back toward the Italian coast. By 1700 UTC, the cyclone made landfall in northern Apulia while maintaining its intensity, with a minimum atmospheric pressure at 988 mbar (29.18 inHg). The cyclone weakened while drifting further inland over the Italian mainland, eventually dissipating as it curved west-southwestward. A later study in 2008 evaluated that the cyclone possessed numerous characteristics seen in tropical cyclones elsewhere, with a spiral appearance, eye-like apparatus, rapid atmospheric pressure decreases in advance of landfall, and intense sustained winds, concentrated near the storm's eyewall; the apparent eye-like structure in the cyclone, however, was ill-defined. Since then, the medicane has been the subject of significant study as a result of the availability of scientific observations and reports related to the cyclone. In particular, the sensitivity of this cyclone to sea-surface temperatures, initial conditions, the model, and the parameterization schemes used in the simulations were analyzed. The relevance of different instability indices for the diagnosis and the prediction of these events were also studied. In November 2011, the first officially designated Mediterranean tropical cyclone by the National Oceanic and Atmospheric Administration (NOAA) formed, christened as Tropical Storm 01M by the Satellite Analysis Branch, and given the name Rolf by the Free University of Berlin (FU Berlin), despite the fact that no agency is officially responsible for monitoring tropical cyclone activity in the Mediterranean. On 4 November 2011, a frontal system associated with another low-pressure area monitored by FU Berlin, designated Quinn, spawned a second low-pressure system inland near Marseille, which was subsequently named Rolf by the university. An upper-level trough on the European mainland stalled as it approached the Pyrenees before approaching and interacting with the low known as Rolf. Heavy rainfall consequently fell over regions of southern France and northwestern Italy, resulting in widespread landslides and flooding. On 5 November, Rolf slowed while stationed above the Massif Central, maintaining a pressure of 1000 mbar (29.53 inHg). A stationary front, stationed between Madrid and Lisbon, approached Rolf the same day, with the cold front later encountering and become associated with Rolf, which would continue for several days. On 6 November, the cyclone drifted toward the Mediterranean from the southern shoreline of France, shrinking to a diameter of merely 150 km (93 mi) across. Slightly weakening, Rolf neared the Balearic Islands on 7 November, associated with two fronts producing heavy rain throughout Europe, before separating entirely and transitioning into a cut-off low. On the same day, the NOAA began monitoring the system, designating it as 01M, marking the first time that it officially monitored a Medicane. A distinct eye-like feature developed while spiral banding and intense convection became evident. At its highest, the Dvorak technique classified the system as T3.0. Convection then gradually decreased, and a misalignment of the mid- and upper-level centers was noted. The cyclone made landfall on 9 November near Hyères in France. The system continued to rapidly weaken on 9 November, before advisories on the system were discontinued later that day, and FU Berlin followed suit by 10 November, removing the name Rolf from its weather maps and declaring its dissipation. The deep warm core of this cyclone persisted for a longer time compared to other tropical-like cyclones in the Mediterranean. At peak intensity, the wind speed reached 45 knots (83 km/h) at a minimum pressure of 991 hPa. The cyclone dumped an accumulated amount of 600 mm of rain over southwestern Europe over a 72 hours period between 6-8 November 2011. The sum of fatalities amounted to 11 people from Italy and France. On 6 November 2014, the low-level circulation centre of Qendresa formed near Kerkennah Islands. As the system was moving north-northeastwards and combining with an upper-level low from Tunisia early on 7 November, the system occluded quickly and intensified dramatically with an eye-like feature, thanks to favourable conditions. Qendresa directly hit Malta when it had lost its fronts with a more well-defined eye, with ten-minute sustained winds at 110.9 km/h (68.9 mph) and the gust at 153.7 km/h (95.5 mph). The central pressure was presumed to be 978 hPa (28.88 inHg). Interacting with Sicily, the cyclone turned northeastwards and started to make an anticlockwise loop. On 8 November, Qendresa crossed Syracuse in the morning and then significantly weakened. Turning southeastwards then moving eastwards, Qendresa moved over Crete, before dissipating over the island on November 11. Early on 28 October 2016, 35 mph (60 km/h) an extratropical cyclone began to develop to the south of Calabria, in the Ionian sea. The system quickly intensified, attaining wind speeds of 50 mph (80 km/h) as it slowly moved to the west, causing high waves and minor damage to cars near the Maltese city of Valletta, weakening the following day and beginning to move eastwards. However, later that day, it began to re-intensify and underwent a tropical transition. On 30 October 12UTC the system showed 10-minute sustained winds of 56 knots (104 km/h). It became a tropical storm on 31 October. After passing over Crete, the storm began to quickly weaken, with the storm degenerating into an extratropical low on 1 November. Tropical Storm 90M was also nicknamed "Medicane Trixi" by some media outlets in Europe during its duration. No fatalities or rainfall statistics have been reported for this system that was over open waters for most of the time. On 11 November 2017, the remnant of Tropical Storm Rina from the Atlantic contributed to the formation of a new extratropical cyclone, west of the British Isles, which later absorbed Rina on the next day. On 12 November, the new storm was named Numa by the Free University of Berlin. On 14 November 2017, Extratropical Cyclone Numa emerged into the Adriatic Sea. On the following day, while crossing Italy, Numa began to undergo a subtropical transition, though the system was still extratropical by 16 November. The storm began to impact Greece as a strong storm on 16 November. Some computer models forecast that Numa could transition into a warm-core subtropical or tropical cyclone within the next few days. On 17 November, Numa completely lost its frontal system. On the afternoon of the same day, Météo France tweeted that Numa had attained the status of a subtropical Mediterranean depression. During the next several hours, Numa continued to strengthen, before reaching its peak intensity on 18 November, as a strong subtropical storm. According to ESTOFEX, Numa showed numerous 45 knots (83 km/h) flags of 10-minute sustained winds in satellite data. Between 18:00 UTC on 17 November and 5:00 UTC on 18 November, Numa acquired evident tropical characteristics, and began to display a hurricane-like structure. ESTOFEX again reported 45 knots (83 km/h). Later on the same day, Numa made landfall in Greece with a station at Kefalonia reporting peak winds of 60 knots (110 km/h) at 998 hPa. The cyclone rapidly weakened into a low-pressure area, before emerging into the Aegean Sea on 19 November. On 20 November, Numa was absorbed into another extratropical storm approaching from the north. Numa hit Greece at a time when the soil was already heavily soaked from other storm systems that did arrive before Numa. The area was forecast to receive up to more than 400 millimetres (16 in) of additional rains in an 48 hours period starting with 16 November. No rainfall forecasts or measurements are known for the following days while Numa was still battering Greece. Numa resulted in 21 reported deaths. At least 1,500 homes were flooded, and residents had to evacuate their homes. The storm caused an estimated US$100 million in damages in Europe and was the deadliest weather event Greece had experienced since 1977. A first outlook about the possible development of a shallow warm-core cyclone in the Mediterranean was issued by ESTOFEX on September 25, 2018, and a second extended outlook was issued on September 26, 2018. On September 27, 2018, an extratropical storm developed in the eastern Mediterranean Sea. Water temperatures of around 27° C (81° F) supported the storm's transition into a hybrid cyclone, with a warm thermal core in the center. The storm moved northeastward toward Greece, gradually intensifying and developing characteristics of a tropical cyclone. On September 29, the storm made landfall at peak intensity in the Peloponnese, west of Kalamata, where a minimum central pressure of 989.3 mbar (29.21 inHg) was reported. ESTOFEX reported on Zorbas as "Mediterreanean Cyclone 2018M02", with the same pressure of 989 mbar (29.2 inHg) at Kalamata, further estimating the minimum central pressure of the cyclone to be 987 mbar (29.1 inHg), with one-minute maximum sustained winds of 120 kilometres per hour (75 mph) and a Dvorak number of T4.0, which all translate into marginal Category 1 hurricane characteristics for the cyclone. It is unknown who named the system Zorbas, but the name is officially recognized for a medicane by the Deutscher Wetterdienst. Early on October 1, Zorbas emerged into the Aegean Sea, while accelerating northeastward. On October 2, Zorbas moved over northwestern Turkey and dissipated. A cold wake was observed in the Mediterranean Sea, with sea surface temperatures dropping 3–4 °C (5–7 °F) along the track of Zorbas due to strong upwelling. During its formative stages, the storm caused flash flooding in Tunisia and Libya, with around 200 mm (8 in) of rainfall observed. The floods killed five people in Tunisia, while also damaging homes, roads, and fields. The Tunisian government pledged financial assistance to residents whose homes were damaged. In advance of the storm's landfall in Greece, the Hellenic National Meteorological Office issued a severe warning. Several flights were canceled, and schools were closed.The offshore islands of Strofades and Rhodes reported gale force winds during the storm's passage. A private weather station in Voutsaras measured wind gusts of 105 km/h (65 mph). The storm spawned a waterspout that moved onshore. Gale force winds in Athens knocked down trees and power lines. A fallen tree destroyed the roof of a school in western Athens. Dozens of roads were closed due to flooding. In Ioannina, the storm damaged the minaret on the top of the Aslan Pasha Mosque, which dates to 1614. From September 29 to 30, Zorbas produced flash flooding in Greece and parts of western Turkey, with the storm dropping as much as 8 inches (20 cm) in Greece and spawning multiple waterspouts. Three people were reporting missing in Greece after the flash floods; one person was found but the other two individuals remained missing, as of October 3. Numerous other Mediterranean tropical-like cyclones have occurred, but few have been as well-documented as the medicanes in 1969, 1982, 1983, 1995, 1996, 2006, 2011, 2014, 2017 & 2018. These not so much investigated tropical-like cyclones and their dates are given below. A first study in 2000 revealed five notable and well-developed medicanes. A second study in 2013 revealed several additional storms with their formation days and also additional information on Medicanes. A third study, conducted in 2007, revealed additional storms with their formation days. A fourth study from 2013 presented several other cyclones and their days of development. A survey made by EUMETSAT resulted in many more cyclones. twice in February 2012, 13-15 April 2012. 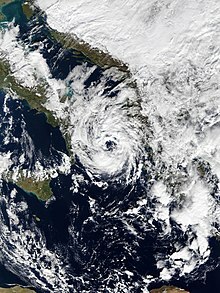 On a number of occasions, tropical-like storms similar to the tropical-like cyclones observed in the Mediterranean have formed in the Black Sea, including storms in 21 March 2002, 7–11 August 2002, and 25–29 September 2005. The 25-29 September 2005 cyclone is particularly well-documented and investigated. No known cyclones in the Black Sea gained hurricane strength. A rare subtropical storm developed in the Bay of Biscay in September 2016, called Stephanie. The storm gained some tropical characteristics on 15 September 2016 just before making landfall along the coast of the Cantabrian Sea when it moved across relatively warm waters (22°C) of the Cantabrian Sea. The strength of the cyclone was reported to be 37 knots (69 km/h). The climatology in the Cantabrian Sea, which is not far away from the Mediterranean Basin, is almost the same as in the Mediterranean, so tropical cyclones might develop here from time to time. Much like the cyclone over the Cantabrian Sea, a rare subtropical cyclone with tropical characteristics developed over the Great Lakes in September 1996, a so-called Huroncane. This storm had reported peak intensities of 118 kilometres per hour (64 kn), making it a system just short of a hurricane. ^ Angela Fritz (16 November 2017). "This is what's behind the dramatic, deadly flooding in Greece". Washington Post. Retrieved 17 November 2017. ^ "'Medicane' bringing 'rough seas' to Mediterranean". Official blog of the Met Office news team. 28 September 2018. Retrieved 29 September 2018. ^ "Thema des Tages - "Medicane Zorbas" - Ein (sub)tropischer Sturm über dem Mittelmeer". www.dwd.de (in German). 29 September 2018. Retrieved 29 September 2018. ^ a b c d e f g h Nastos P.T. ; Karavana-Papadimou K.; Matsangouras I.T. (5 September 2015). "Tropical-like Cyclones in the Mediterranean: Impacts and Composite Daily Means and Anomalies of Synoptic Conditions" (PDF). University of Athens. Retrieved 22 November 2017. ^ a b c d Cavicchia, L.; von Storch, H.; Gualdi, S. (September 2014). "A long-term climatology of medicanes" (PDF). Climate Dynamics. 43 (5–6): 1183–1195. Bibcode:2014ClDy...43.1183C. doi:10.1007/s00382-013-1893-7. ^ Sarah Fecht (22 November 2017). "What we know about medicanes—hurricane-like storms in the Mediterranean". Phys.org. Retrieved 23 November 2017. ^ Jeff Masters. "Subtropical Storms – Tropical, subtropical, extratropical?". Retrieved 9 October 2018. ^ a b "TCFAQ F1) What regions around the globe have tropical cyclones and who". National Oceanic and Atmospheric Administration. Hurricane Research Division, Atlantic Oceanographic and Meteorological Laboratory. Retrieved 24 February 2014. ^ a b c "2011 Tropical Bulletin Archive". National Oceanic and Atmospheric Administration. National Environmental Satellite, Data, and Information Service. 30 December 2011. Retrieved 23 February 2014. ^ a b "Rare Mediterranean tropical-like cyclone forms, heading toward Greece". The Watchers. 18 November 2017. Retrieved 18 November 2017. ^ "EMMC on Twitter". European Medicane Monitoring Center. October 2017. Retrieved 19 November 2017. ^ "OMM-JCOMM-GMDSS / World Marine Weather Forecast". Global Maritime Distress and Safety System. Météo-France. Retrieved 24 February 2014. ^ "SIGNIFICANT WEATHER and CLIMATIC EVENTS in GREECE during 2017" (PDF). Hellenic National Meteorological Service. 2018. Retrieved 6 October 2018. ^ a b Medicane season 2015 (to be updated) (Report). 2015-10-22. Retrieved 2018-10-06. ^ Beven, John L. (2005-10-27). Tropical Storm Beta Discussion Number 3 (Report). Hurricane Beta Advisory Archive. National Hurricane Center. Retrieved 2013-05-07. ^ a b Anna Wieczorek (1 September 2015). "Medicanes – die Hurrikane des Mittelmeeres?" (in German). DWD. Retrieved 7 October 2018. ^ "SECTION 2. INTENSITY OBSERVATION AND FORECAST ERRORS". United States Navy. Archived from the original on 2007-09-16. Retrieved 2018-10-07. ^ Jeff Masters (7 November 2014). "Rare Medicane Hits Malta and Sicily With Tropical Storm-Like Conditions". Weather Underground. Retrieved 20 November 2017. ^ Andrea Buzzi; Piero Malguzzi; Guido Cioni (2014). "Thermal structure and dynamical modeling of a Mediterranean Tropical-like cyclone". University of Bologna. Retrieved 21 November 2017. ^ Jean-Pierre Chaboureau; Florian Pantillon; Dominique Lambert; Evelyne Richard; Chantal Claudb (10 November 2011). "Tropical transition of a Mediterranean storm by jet crossing" (PDF). Royal Meteorological Society. Retrieved 22 November 2017. ^ Marc Schwartz (7 November 2011). "01M (Noname) Tropical Bulletin: 11/07 at 1800Z". Retrieved 17 November 2017. ^ a b c d Ilmer, P. (8 December 2011). "Lebensgeschichte: Tiefdruckgebiet Rolf". Freie Universität Berlin (in German). Institut für Meteorologie. Retrieved 23 February 2014. ^ "Europe Weather Analysis on 2011-11-05". Free University of Berlin. 5 November 2017. Retrieved 16 August 2013. ^ Stephen Davenport (10 November 2011). ""Medicane" hits the western Med". WeatherCast. Retrieved 21 November 2017. ^ a b c d "Development of a tropical storm in the Mediterranean Sea (6-9 November 2011)". EUMETSAT. 2012. Retrieved 7 October 2018. ^ a b Sachweh, Michael (7 January 2015). "Qendresa - ein bemerkenswerter Medicane" (PDF) (in German). Munich: Free University of Berlin. Retrieved 1 November 2016. ^ "A Medicane (MEDIterranean hurriCANE) or Tropical-Like Cyclone (TLC) brought severe weather to parts of the Mediterranean in early November". EUMETSAT. 8 November 2014. Retrieved 5 November 2016. ^ "Weather Chart" (GIF) (in German). Free University of Berlin. 9 November 2014. Retrieved 4 November 2016. ^ "Weather Chart" (GIF) (in German). Free University of Berlin. 11 November 2014. Retrieved 24 December 2016. ^ "Watch: Strong Wave Batter Valletta Shoreline". timesofmalta.com. 28 October 2016. Retrieved 30 October 2016. ^ a b "Medicane Trixi" (in German). Deutscher Wetterdienst. November 1, 2016. Retrieved October 2, 2017. ^ a b Erdman, John (31 October 2016). "Halloween Surprise: Rare Tropical Storm Forms in Mediterranean Sea". Retrieved 3 November 2016. ^ "Europe Weather Analysis on 2017-11-16". Free University of Berlin. 16 November 2017. Retrieved 17 November 2017. ^ a b Ben Henson (16 November 2017). "More Heavy Rain—and a Medicane—Are Possible as Cyclone Numa Churns Near Greece". Weather Underground. Retrieved 17 November 2017. ^ "Europe Weather Analysis on 2017-11-17". Free University of Berlin. 17 November 2017. Retrieved 18 November 2017. ^ @meteofrance (17 November 2017). "#Numa a désormais les caractéristiques d'un #medicane 🌀, dépression méditerranéenne subtropicale #Grèce #Italie #Balkans" (Tweet) (in French) – via Twitter. ^ Tuschy (18 November 2017). "Mesoscale Discussion: Sat 18 Nov 2017, 11:08 UTC". Retrieved 2 December 2017. ^ "'Medicane NUMA, un ciclone tropicale nel Mediterraneo". 21 November 2017. ^ "Europe Weather Analysis on 2017-11-19". Free University of Berlin. 19 November 2017. Retrieved 19 November 2017. ^ "Europe Weather Analysis on 2017-11-20". Free University of Berlin. 20 November 2017. Retrieved 20 November 2017. ^ "Rare hybrid tropical storm in the Mediterranean Sea". Bloomberg. 20 November 2017. Retrieved 2 December 2017. ^ "Global Catastrophe Recap - November 2017" (PDF). Aon Benfield. 7 December 2017. p. 5. Retrieved 26 September 2018. ^ Everton Fox (19 November 2017). "Storm Numa forms in the Mediterranean". Al Jazeera. Retrieved 20 November 2017. ^ "Extended Forecast Tue 25 Sep 2018 19:50". ESTOFEX. September 25, 2018. Retrieved 5 October 2018. ^ "Extended Forecast Wed 26 Sep 2018 20:13". ESTOFEX. September 26, 2018. Retrieved 5 October 2018. ^ "Europe Weather Analysis on 2018-9-27". Free University of Berlin. 27 September 2018. Retrieved 29 September 2018. ^ a b Jeff Masters (September 29, 2018). "Tropical Storm-Like Medicane Hits Greece". Weather Underground. Retrieved September 29, 2018. ^ "Mesoscale Discussion Sat 29 Sep 2018 12:29". ESTOFEX. September 29, 2018. Retrieved 5 October 2018. ^ "Europe Weather Analysis on 29 September 2018 00 UTC" (GIF). Free University of Berlin (in German). Deutscher Wetterdienst. 29 September 2018. Retrieved 29 September 2018. ^ "Europe Weather Analysis on 2018-10-01". Free University of Berlin. 1 October 2018. Retrieved 3 October 2018. ^ "Europe Weather Analysis on 2018-10-02". Free University of Berlin. 2 October 2018. Retrieved 3 October 2018. ^ "Medicane cools the waters of central Mediterranean to colder than average". Severe Weather Europe. 5 October 2018. Retrieved 8 October 2018. ^ Simon Veazey (29 September 2018). "Rare Hurricane-Like Medicane Storm Hits Europe". The Epoch Times. Retrieved 29 September 2018. ^ Jonathan Belles (29 September 2018). "A Medicane Is Swirling in the Mediterranean Sea Into Greece: Here's What That Means". The Weather Channel. Retrieved 29 September 2018. ^ "Tunisia floods kill at least 4, cause major damage". Associated Press. 23 September 2018. Retrieved 29 September 2018. ^ a b Elinda Labropoulou; Brandon Miller (29 September 2018). "'Medicane,' a rare, hurricane-like storm, is on track to hit Europe". CNN. Retrieved 29 September 2018. ^ "Storm hits Greek capital with downpours, gale-force winds as it continues east". Kathimerini English Edition. 29 September 2018. Retrieved 29 September 2018. ^ "Xenophon Storm Could Turn into Mediterranean Hurricane, Meteo Warns". The National Herald. 27 September 2018. Retrieved 29 September 2018. ^ Nick Austin (3 October 2018). "Cyclone floods parts of Greece, two people missing". FreightWaves. Retrieved 3 October 2018. ^ V. V. Efimov; S. V. Stanichnyi; M. V. Shokurov; D. A. Yarovaya (19 March 2007). "Observations of a Quasi-Tropical Cyclone over the Black Sea". Allerton Press. Retrieved 22 November 2017. ^ V. V. Efimov; M. V. Shokurov; D. A. Yarovaya (2007). "Numerical Simulation of a Quasi-Tropical Cyclone over the Black Sea". Izvestiya, Atmospheric and Oceanic Physics. 43: 723–743. arXiv:0906.2191. Anagnostopoulou, C.; Tolika, K.; Flocas, H.; Maheras, P. (January 2006). "Cyclones in the Mediterranean region: present and future climate scenarios derived from a general circulation model (HadAM3P)". Advances in Geosciences. 7: 9–14. doi:10.5194/adgeo-7-9-2006. Bakkensen, L. A. (January 2016). "Estimating the Damages of Mediterranean Hurricanes" (PDF). University of Arizona. Retrieved 22 November 2017. Blier, W.; Ma, Q. (1997). A Mediterranean Sea hurricane?. Preprints, 22nd Conference on Hurricanes and Tropical Meteorology. American Meteorological Society. pp. 592–595. Cavicchia, L.; von Storch, H. (November 2012). "The simulation of medicanes in a high-resolution regional climate model" (PDF). Climate Dynamics. 39 (9–10): 2273–2290. Bibcode:2012ClDy...39.2273C. doi:10.1007/s00382-011-1220-0. Cavicchia, L.; von Storch, H.; Gualdi, S. (October 2014). "Mediterranean tropical-like cyclones in present and future climate". Journal of Climate. 27 (19): 7493–7501. Bibcode:2014JCli...27.7493C. doi:10.1175/JCLI-D-14-00339.1. Cerrai, D. (January 2015). "Moisture and Potential Vorticity in Medicanes: Theoretical Approach and Case Studies" (PDF). University of Bologna. Retrieved 22 November 2017. Claud, C.; Alhammoud, B.; Funatsu, B.M. ; Chaboureau, J.-P. (October 2010). "Mediterranean hurricanes: large-scale environment and convective and precipitating areas from satellite microwave observations". Natural Hazards and Earth System Sciences. 10 (10): 2199–2213. Bibcode:2010NHESS..10.2199C. doi:10.5194/nhess-10-2199-2010. Conte, D.; Miglietta, M.M. ; Levizzani, V. (July 2011). "Analysis of instability indices during the development of a Mediterranean tropical-like cyclone using MSG-SEVIRI products and the LAPS model". Atmospheric Research. 101 (1–2): 264–279. Bibcode:2011AtmRe.101..264C. doi:10.1016/j.atmosres.2011.02.016. Dafis, S.; Rysman, J.F. ; Claud, C.; Flaounas, E. (July 2018). "Remote sensing of deep convection within a tropical‐like cyclone over the Mediterranean Sea". Atmospheric Science Letters. 19 (6): 283–286. doi:10.1002/asl.823. Davolio, S.; Miglietta, M.M. ; Moscatello, A.; Pacifico, A.; Buzzi, A.; Rotunno, R. (April 2009). "Numerical forecast and analysis of a tropical-like cyclone in the Ionian Sea". Natural Hazards and Earth System Sciences. 9 (2): 551–562. doi:10.5194/nhess-9-551-2009. Emanuel, K. (June 2005). "Genesis and maintenance of 'Mediterranean hurricanes'". Advances in Geosciences. 2: 217–220. doi:10.5194/adgeo-2-217-2005. Ernst, J.A. ; Matson, M. (November 1983). "A Mediterranean tropical storm?". Weather. 38 (11): 332–337. Bibcode:1983Wthr...38..332E. doi:10.1002/j.1477-8696.1983.tb04818.x. Fita, L.; Romero, R.; Luque, A.; Emanuel, K.; Ramis, C. (January 2007). "Analysis of the environments of seven Mediterranean tropical-like storms using an axisymmetric, nonhydrostatic, cloud resolving model". Natural Hazards and Earth System Sciences. 7 (1): 41–56. doi:10.5194/nhess-7-41-2007. Fita, L.; Romero, R.; Luque, A.; Emanuel, K.; Ramis, C. (2007). "Tropical-like Mediterranean Storms: an analysis from satellite". Balearic Islands University. CiteSeerX 10.1.1.489.5889. Gaertner, M.A. ; Jacob, D.; Gil, V.; Domínguez, M.; Padorno, E.; Sánchez, E.; Castro, M. (July 2007). "Tropical cyclones over the Mediterranean Sea in climate change simulations". Geophysical Research Letters. 34 (14): L14711. Bibcode:2007GeoRL..3414711G. doi:10.1029/2007GL029977. Homar, V.; Romero, R.; Stensrud, D.J. ; Ramis, C.; Alonso, S. (April 2003). "Numerical diagnosis of a small, quasi-tropical cyclone over the western Mediterranean: Dynamical vs. boundary factors". Quarterly Journal of the Royal Meteorological Society. 129 (590): 1469–1490. Bibcode:2003QJRMS.129.1469H. doi:10.1256/qj.01.91. hdl:10261/88259. Lagouvardos, K.; Kotroni, V.; Nickovic, S.; Kallos, D.; Tremback, C.J. (July 1999). "Observations and model simulations of a winter sub‐synoptic vortex over the central Mediterranean". Meteorological Applications. 6 (4): 371–383. doi:10.1017/S1350482799001309. Levizzani, V.; Laviola, S.; Malvaldi, A.; Miglietta, M.M. ; Cattani, E. (20 October 2012). "Severe storms over the Mediterranean Sea: A satellite and model analysis" (PDF). Institute of Atmospheric Sciences and Climate. Retrieved 3 December 2017. Mazon, J.; Lupo, A. (20 May 2017). "Sensitivity of a Mediterranean Tropical-Like Cyclone to Different Model Configurations and Coupling Strategies". MDPI. Retrieved 22 November 2017. Miglietta, M.M. ; Moscatello, A.; Conte, D.; Mannarini, G.; Lacorata, G.; Rotunno, R. (July 2011). "Numerical analysis of a Mediterranean 'hurricane' over south-eastern Italy: Sensitivity experiments to sea surface temperature". Atmospheric Research. 101 (1–2): 412–426. Bibcode:2011AtmRe.101..412M. doi:10.1016/j.atmosres.2011.04.006. Miglietta, M.M. ; Mastrangelo, D.; Conte, D. (February 2015). "Influence of physics parameterization schemes on the simulation of a tropical-like cyclone in the Mediterranean Sea". Atmospheric Research. 153 (1): 360–375. Bibcode:2015AtmRe.153..360M. doi:10.1016/j.atmosres.2014.09.008. Miglietta, M.M. ; Laviola, S.; Malvaldi, A.; Conte, D.; Levizzani, V.; Price, C. (May 2013). "Analysis of tropical-like cyclones over the Mediterranean Sea through a combined modeling and satellite approach". Geophysical Research Letters. 40 (10): 2400–2405. Bibcode:2013GeoRL..40.2400M. doi:10.1002/grl.50432. Moscatello, A.; Miglietta, M.M. ; Rotunno, R. (October 2008). "Observational analysis of a Mediterranean 'hurricane' over southeastern Italy". Weather. 63 (10): 306–311. Bibcode:2008Wthr...63..306M. doi:10.1002/wea.231. Moscatello, A.; Miglietta, M.M. ; Rotunno, R. (November 2008). "Numerical analysis of a Mediterranean 'hurricane' over southeastern Italy". Monthly Weather Review. 136 (11): 4373–4397. Bibcode:2008MWRv..136.4373M. doi:10.1175/2008MWR2512.1. Pantillon, F.-P.; Chaboureau, J-P.; Mascart, P.J. (3 June 2013). "Predictability of a Mediterranean Tropical-Like Storm Downstream of the Extratropical Transition of Hurricane Helene (2006)". Monthly Weather Review. 141 (6): 1943–1962. doi:10.1175/MWR-D-12-00164.1. Pedro C. Fernández Sanz. "Los medicanes o bajas mesoescalares con apariencia de ciclón tropical en la cuenca mediterránea: algunos casos de 2007" (in Spanish). Retrieved 2010-06-03. Picornell, M.A. ; Campins, J.; Jansà, A. (7 May 2014). "Detection and thermal description of medicanes from numerical simulation" (PDF). Copernicus Publications. Retrieved 1 December 2017. Pytharoulis, I.; Craig, G.C. ; Ballard, S.P. (June 1999). "Study of a hurricane-like Mediterranean cyclone of January 1995". Physics and Chemistry of the Earth. 24 (6): 627–632. Bibcode:1999PCEB...24..627P. doi:10.1016/S1464-1909(99)00056-8. Pytharoulis, I.; Craig, G.C. ; Ballard, S.P. (September 2000). 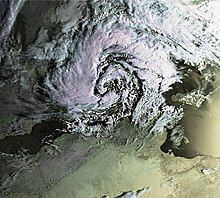 "The hurricane-like Mediterranean cyclone of January 1995". Meteorological Applications. 7 (3): 261–279. Bibcode:2000MeApp...7..261P. doi:10.1017/S1350482700001511. Reale, O.; Atlas, R. (February 1998). "A Tropical-Like Cyclone in the Extratropics" (PDF). ICTP. Retrieved 30 November 2017. Reed, R.J.; Kuo, Y.-H.; Albright, M.D. ; Gao, K.; Guo, Y.-R.; Huang, W. (April 2001). "Analysis and modeling of a tropical-like cyclone in the Mediterranean Sea". Meteorology and Atmospheric Physics. 76 (3–4): 183–202. Bibcode:2001MAP....76..183R. doi:10.1007/s007030170029. Romero, R.; Emanuel, K. (June 2013). "Medicane risk in a changing climate" (PDF). Journal of Geophysical Research: Atmospheres. 118 (12): 5992–6001. Bibcode:2013JGRD..118.5992R. doi:10.1002/jgrd.50475. Tous, M.; Romero, R. (2011). "Meteorological environments associated with medicane development" (PDF). Tethys. Retrieved 22 November 2017. Tous, M.; Romero, R. (January 2013). "Meteorological environments associated with medicane development". International Journal of Climatology. 33 (1): 1–14. Bibcode:2013IJCli..33....1T. doi:10.1002/joc.3428. Walsh, K.; Giorgi, F.; Coppola, E. (September 2014). "Mediterranean warm-core cyclones in a warmer world". Climate Dynamics. 42 (3–4): 1053–1066. Bibcode:2014ClDy...42.1053W. doi:10.1007/s00382-013-1723-y. Winstanley, D. (September 1970). "The North African flood disaster, September 1969". Weather. 25 (9): 390–403. Bibcode:1970Wthr...25..390W. doi:10.1002/j.1477-8696.1970.tb04128.x. Miglietta, Mario Marcello; R. Rotunno (2019). "Development mechanisms for Mediterranean tropical‐like cyclones (medicanes)". Q. J. R. Meteorol. Soc. : 1–17. doi:10.1002/qj.3503.